I often bemoan those days of yore when cameras weren't ubiquitous. so many precious ones with whom I have no photos. so many grand events just hanging on by a memory. so it was lovely to find this online. 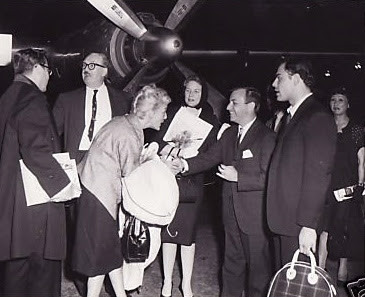 it shows producer Ross Hunter arriving at Cleveland Hopkins with Virginia Grey & John Saxon & Anna May Wong. my stories abt them at the premiere of this film at the Hippodrome in 1960 are easy to find. & altho heretofore there has been no photographic evidence at last I have this. as close as I'll get to my actual memories of talking with these film legends. I don't understand them. I mean why do we dream what we dream? maybe there is an answer which I haven't uncoverd. whatever..... I'm constantly intrigued by their content. last nite I dreamt that I was meeting a high school English teacher named Jeri Lu Wagstaff. she was important in my development as a serious writer because she encouraged me. in the dream I did what I've been unable to do in real life -- to thank her in person. this is the only photo I have of her. I took it when some of her best students (Roberta & Tom & Martha & I) surprised her with an art installation & performance art. yesterday I rec'd my annual Xmas card from Roberta (now living in London). maybe that was a trigger for this dream? so I may not understand dreams. I may not like all of them. but this one made me feel good. I cdn't listen to any more news of the tax bill from the idiot in the White House & the Republican millionaires in Congress. so I watchd the Disney version of the Robin Hood tale. as a boy I was a Disney fan & after seeing this fell for Richard Todd. it was decades before I finally saw him in Beverly Hills. I was a bit startled at how short he was. his date that nite was his friend & sometimes co-star Glynis Johns -- equally diminutive. they were so cute together reminding me of the couple on the wedding cake. 1) tonite's TCM screening was hostd by Leonard Maltin. in his post screening chatter he switched the names of actors James Robertson Justice & James Hayter. 2) I'd forgotten that Peter Finch playd the dastardly Sheriff of Nottingham. one day we'll be neighbors for eternity. his space is down the hall & around the corner from mine. I love Poems For All. these wee books are publishd with such love by Robert Hansen. & now he's done a 4th poem of mine -- "loiter at my lines." I'm not much of a Xmas person but I have had a box of seasonal items for decades. some years I take them out & "decorate." others not. last year was my first Xmas since becoming a Palm Springs resident. 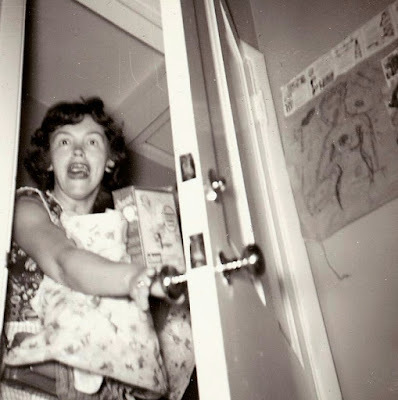 but my remodel had only been finishd weeks before & I was in no mood to strew the house with knicknackery. this year I decided to bring all the memories out of storage. the wreath has special meaning for me now. Dad made it from grapevine in the backyard on Winckles St. the stuffd joy was a gift from Dug Funnel years ago. I've never been a fan of Xmas trees but have assembled ornaments over the years. the first house I ever ownd by myself was the one on Morris Rd in Kent. 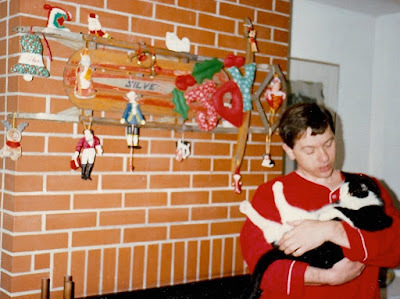 my boyhood sled was mountd above the fireplace & I'd put the ornaments on it. in my house in Santa Fe I brought the items out in the years I knew I was having houseguests. then is was on my fireplace mantel. here the sled is in my master bathroom & I have no fireplace. so I assembled the memories on my livingroom table.